I doubt that there is anybody, apart, possibly, from the millennials, that don’t know about Seinfeld. Praised for its witty humor about some of life’s most mundane moments while still asking perplexing questions about various situations was what drew people to Seinfeld. Now with the show ended, author Jennifer Keishin Armstrong captured the beginnings and the behind-the-scenes of the story of two guys who dreamed up Seinfeld, in her book Seinfeld: How A Show About Nothing Changed Everything. 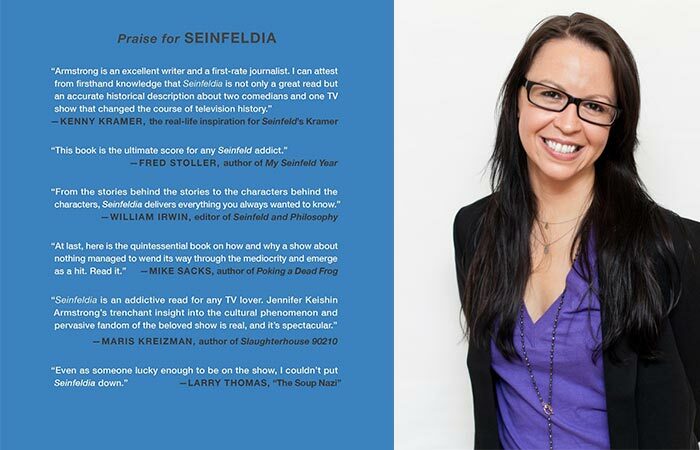 Jennifer Keishin Armstrong, an acclaimed entertainment writer and TV historian, wrote Seinfeldia as a celebration to both the creators, comedians Jerry Seinfeld and Larry David, and the fans of the critically acclaimed comedy show that changed millions of people’s lives. It should come as no surprise, but Seinfeld is a legendary name when it comes to comedy and the author has managed to hilariously capture all the moments from the conception of the show when Larry David and Jerry Seinfeld sat down for a coffee and had a dream, to exclusive behind-the-scenes stories while the show was still airing and all the way to how it affected Americans, and the rest of the world, in interesting ways and touched the lives of many people. Author Jennifer Keishin Armstrong has received nothing but praise for Seinfeldia: How A Show About Nothing Changed Everything. For those familiar with the show, we all know what a hit it was and, even though at times, through hilarious trials and tribulations, Seinfeld is truly a success story and this book, Seinfeldia stunningly captures ‘How A Show About Nothing Changed Everything’, literally did change everything. Seinfeldia is currently the Number 1 Best-seller on Amazon and will be released on the 5th of July.